William H. Jones, The Rowell Family of New England and Their English Origins, 1560-1900, Heritage Books, (1996) , p. 4. Robert William Barnes, Colonial Families of Maryland: Bound and Determined to Succeed, , at https://books.google.com/books?id=Zg9ScOKWei8C . Baltimore, Maryland: Clearfield, (2007) , p. 139. New Hampshire. Registrar of Vital Statistics, Index to marriages, early to 1900, Salt Lake City: Filmed by the Genealogical Society of Utah, (1975-1976) Microfilm #1000976 of the Family History Library, Salt Lake City, Utah: Index to marriages - Calef to Columbia , certified by George H. Hubbard, ckerk of Boscawen. Vital records of Amesbury, Massachusetts to the end of the year 1849, , at https://archive.org/details/vitalrecordsofam00ames . Topsfield, Mass. : Topsfield Historical Society, (1913) , p. 206. "New Hampshire Marriage Records, 1637-1947," database with images, FamilySearch (https://familysearch.org/ark:/61903/1:1:FL6K-SM2 : 12 December 2014), Aaron Colby and Edith Rowell, 25 Dec 1816; citing Bow, Merrimack, New Hampshire, Bureau of Vital Records and Health Statistics, Concord; FHL microfilm 1,000,976. Record added: Oct 25, 2011. Vital records of Amesbury, Massachusetts to the end of the year 1849, , at https://archive.org/details/vitalrecordsofam00ames . Topsfield, Mass. : Topsfield Historical Society, (1913) , p. 527. Matthew Adams Stickney, The Fowler Family: a Genealogical Memoir of the Descendants of Philip and Mary Fowler, of Ipswich, Mass: Ten Generations: 1590-1882, , at https://books.google.com/books?id=RMwUAAAAYAAJ . Salem, Mass. : Salem Press, (1883) , pp. 11-9. Vital Records of Ipswich Massachusetts to the end of the year 1849, Salem, Mass. : The Essex Institute, (1910) , Vol. 3, p. 666. Vital records of Salisbury, Massachusetts, to the end of the year 1849, Topsfield, Mass. : Topsfield Historical Society, (1915) , p. 613. Vital records of Salisbury, Massachusetts, to the end of the year 1849, Topsfield, Mass. : Topsfield Historical Society, (1915) , p. 211. Vital records of Salisbury, Massachusetts, to the end of the year 1849, Topsfield, Mass. : Topsfield Historical Society, (1915) , p. 470. "New Hampshire Death Certificates, 1938-1959," database with images, FamilySearch (https://familysearch.org/ark:/61903/1:1:QV3Q-T9XC : 9 September 2014), Martha Augusta Carbee, 13 Mar 1953; citing Manchester, Hillsborough, New Hampshire, United States, p. No 1081-1624, New Hampshire Division of Vital Records, Concord. 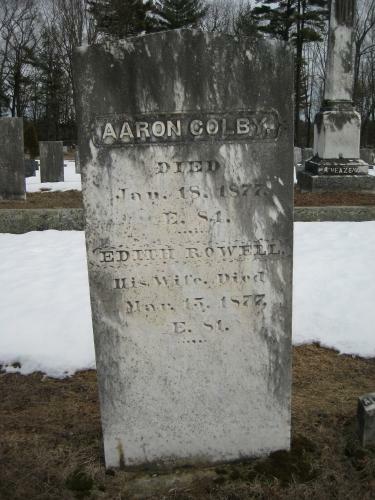 "New Hampshire Birth Records, Early to 1900," database with images, FamilySearch (https://familysearch.org/ark:/61903/1:1:FLPH-ZP1 : 12 December 2014), Martha Rowell, 01 Sep 1858; citing Hooksett, Merrimack, New Hampshire, United States, Bureau of Vital Records and Health Statistics, Concord; FHL microfilm 1,001,037. Philip Rowell was killed by Indians on July 7, 1690 at age 42.